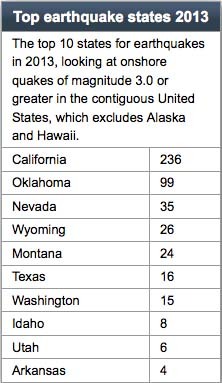 Texas ranked 8th in 2013 in the top ten states for earthquakes of magnitude 3.0 or grater. Prior to the fracking boom, Texas was one of the least likely places in the United States for earthquakes. Man-made earthquakes are nothing new. We have known since 1870, that man’s actions can cause earthquakes. We have known since the 1960s that injection can cause man-made earthquakes. Extraction of hydrocarbons also causes earthquakes. …but that is not true. What is new is the frequency of these man-made earthquakes and the “remarkable increase” in man-made earthquakes coincides directly with the fracking boom according to a USGS team. It should not be a surprise to anyone who has been paying attention that Texas has become a top earthquake producer because Texas is the top oil and gas producer. Earthquakes follow oil and gas production. If the stress change is big enough, it can cause an earthquake, either by fracturing the rock mass—in the case of mining or underground explosions—or by causing rock to slip along existing zones of weakness. The situation in regions of hydrocarbon recovery is not always well understood: in some places, extraction of fluid induces seismicity; in others, injection induces seismicity. In many areas where the rock is not under large tectonic stresses, the seismic energy released during induced events is low—typically of magnitude 0 to 3—and not even felt on the earth’s surface. However, if the rock mass is already under large tectonic stresses, the energy added by man’s endeavors can have a destabilizing influence. Even minor actions can trigger strong seismicity. Some 40 examples are known in which reservoir production caused significant changes in the seismic activity of a neighboring region. Recap: Injection, extraction and underground explosions all can cause earthquakes. We’ve known this for a long, long time. Fracking injection – one well requires millions of gallons of water, thousands of tons of sand and thousands a gallons of chemicals all injected under very high pressure, 5,000 to 8,000 pounds-per-square-inch (PSI). Waste disposal injection – one disposal well injects under lesser pressure the massive amounts of waste fluids the from many fracked wells. As I’ve said before: Industry has done such a splendid job of propaganda that the media and public believe the only injection that causes earthquakes is waste injection. If you understand the fracking process and think logically about it, you will see that we are redistributing massive amounts of liquids and solids and causing imbalances. See these diagrams drawn by a petroleum engineer. Diagram. Hydraulic fracturing is injection and hydraulic fracturing has caused earthquakes (see a list here). But industry tries to deny any involvement. It’s the fracking industry’s Deadbeat Dad Problem. Who’s your fracking daddy?The oil and gas industry has narrowly defined fracking to mean only the moment they inject their fluids into the hole and fracking is over when they pull out. They are trying to dodge responsibility for the whole realm of descendant problems their actions create. The industry is like deadbeat dads who, in this case, inject toxic fluids into a hole in the ground and walk away from responsibility for the consequences. The public ends up paying while industry walks away with their profit. @AustinRue @LJWorld Fracking is a process. Disposal is a diff process. They’re regulated under diff laws, because they’re diff processes. I’ve written a great deal about earthquakes for a long time. But, as fracking expands and the “remarkable increase” in man-made earthquakes continues, new people become interested. So I guess I’ll have to keep writing about earthquakes for no telling how much longer. Please see: Dear Irving… for some frightening facts about man-made earthquakes and this post for some updated news. Update: The epidemic continues with 4 earthquakes (so far) today. See the list of reported earthquakes on this post. Dear Irving: If you own a home, you should acquire earthquake insurance while it’s still affordable and while insurance companies are still offering it. Trust me, neither will last at the current rate of activity. What Texas needs is a statewide moratorium on all drilling, fracking, and extraction activity. Then we can see if the seismicity calms down. That’s exactly what needs to happen but, sadly, it won’t. Many gas wells in Tx are tubingless completions and with age, have corroded and damaged casing. If production is stopped, pressure can build up and cause an underground blowout or other transmissions of pressures so as to cause water aquifer contamination and even earthquakes. The earthquakes are bad, I agree but which is worse earthquakes or water that you can light on fire?